We filtered out those benchmarks that showed a 30% improvement over Magny-Cours (based on the K10 core). Remember the Bulldozer architecture has been designed to deliver 33% more cores in the same power envelope while keeping the IPC more or less at 95% of the K10. The rest of the performance should have come from a clock speed increase. The clock speed increases did not materialize in the real world, and we also kept the clock speed the same to focus on the architecture. Where a 30-35% performance increase is good, anything over 35% indicates that the Bulldozer architecture handles that particular sort of software better than Magny-Cours. The Libquantum score is the most spectacular. Bulldozer performs over twice as fast and the score of 2750 is not that far from the all mighty Xeon 2660 at 2.2GHz (3310). Bulldozer here is only 17% slower. 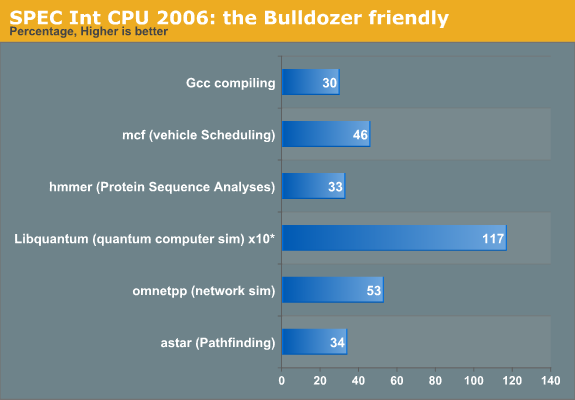 At first sight, there is nothing that should make Libquantum run very fast on Bulldozer. Libquantum contains a high amount of branches (27%) and we have seen before that although Bulldozer has a somewhat improved branch predictor, the deeper pipeline and higher branch misprediction penalty can cause a lot of trouble. In fact, Perlbench (23%), Sjeng Chess (21%), and Gobmk (AI, 21%) are branchy software and are among the worst performing tests on Bulldozer. Luckily, Libquantum has a much easier to predict branches: libquantum is among the software pieces that has the lowest branch misprediction rates (less than six per 1000 instructions). We all know that Bulldozer can deal much better with loads and stores than Magny-Cours. However, libquantum has the lowest (!) amount of load/stores (19%=14% Loads, 5% Stores). The improved Memory Level Parallelism of Bulldozer is not the answer. The table below gives an idea of the instruction mix of SPEC CPU2006int. * IPC as measured on Core 2 Duo. Libquantum has a relatively high amount of cache misses on most CPUs as it works with a 32MB data set, so it benefits from a larger cache. The 8MB L3 vs 6MB L3 might have boosted performance a bit, but the main reason is vastly improved prefetching inside Bulldozer. According to the researchers of the university of Austin and Microsoft, the prefetch requests in libquantum are very accurate. If you check AMD's own publications you'll notice that there were two major improvements to improve the single-threaded performance of the Bulldozer architecture (compared to the previous ones): an improved Turbo Core and vastly improved prefetching. Next, let's look at the excellent mcf result. mcf is by far the most memory intensive SPEC CPU Int benchmark out there. mcf misses the L1 data cache about five times more than all the other benchmarks on average. The hit rate is lower than 70%! mcf also misses the last level cache up to eight times more than all other benchmarks. Clearly mcf is a prime candidate to benefit from the vastly improved L/S units of Bulldozer. Omnetpp is not that extreme, but the instruction mix has 52% loads and stores, and the L2 and last level cache misses are twice as high as the rest of the pack. In contrast to mcf, the amount of branch mispredictions is much lower, despite the fact that it has a similar, relatively high percentage of branches (20%). So the somewhat lower reliance on the memory subsystem is largely compensated for by a much lower amount of branch mispredictions. To be more precise: the amount of branch predictions is about three times lower! This most likely explains why Bulldozer makes a slightly larger step forward in omnetpp compared to the previous AMD architecture than in it does in mcf.